Kirby Girl, a spin-off of Kirby and Company, is officially opening May 2nd down the street from the Sugar Bowl. As the store is getting its final touches, Ms. Elaine McCleary, the owner, and mother of two, and Ms. Sue Curry, the manager, are psyched about finally having a store for young girls in town. Targeted for ages 10-25, the shop will have a variety of items, from birthday party gifts and dorm decorations to a wall filled with much candy to choose from. The motivation behind this new boutique is for girls to have a fun destination to go shopping for themselves or for gifts. There is a huge wall filled with prepackaged candy, with Kirby Girl’s own branding, in addition to a 10-foot high gumball machine. “The whole premise of the business is really empowerment of girls, so we are giving girls a place where they can feel empowered; where there’s things that speak to them, whether its a book or a necklace.” Ms. Curry said. Ms. McCleary’s inspiration for Kirby Girl is a result of her store Kirby and Company and her daughters. After getting to know her customers and what is needed for the community, she believed that young girls were not being marketed to in town. Her two girls were constantly saying that there are no cool stores for t-shirts or just hanging out with their friends. Since each girl has her own sense of style and a unique taste for her surroundings, Ms. McCleary wants her store to have gifts, accessories, decor, and a little bit of fashion for girls, while not being too expensive and affordable for younger Darien residents. Kirby Girl stocks goods from between 200-300 vendors, many being small, local, and female-owned companies. They have had many private labels made for them. Since the shop has a wide variety of merchandise, they hope to fill it with products that are harder to find in Darien. “What we’re trying to do with Kirby Girl is bring a little bit of a street vibe to Darien. We really want to give you, locally, access to the things you are already seeing on Instagram and what you see all over New York City,” Ms. McCleary said. 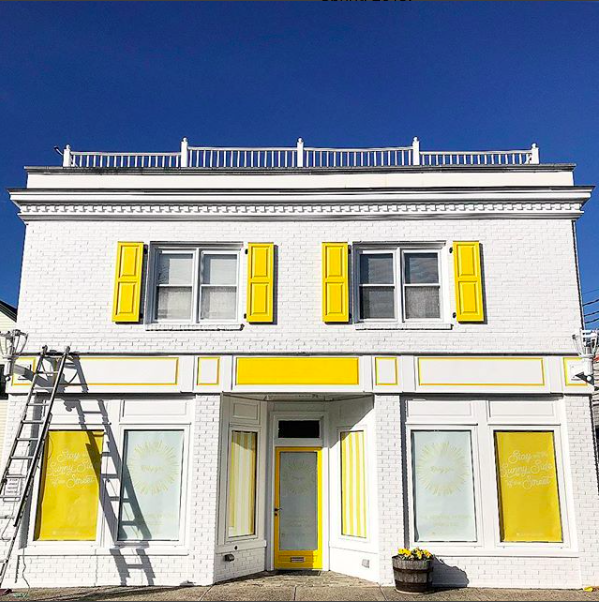 With their catchphrase being “Stay on the sunny side of the street” and the color yellow shown throughout the entirety of the store, they hope to put an emphasis on kindness and confidence. There have been talks about giving a free token for the gumball machine to customers in return for sharing about an act of kindness they did that day. There is also a wall where they can write words of encouragement on a Post-it note for others to read and aspire to. 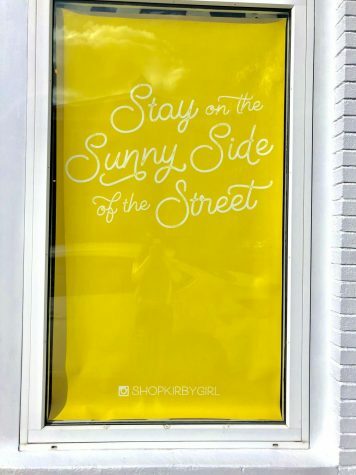 Stay on the Sunny Side of the Street window poster. Many assume the store is geared towards girls. However, despite the name, the shop is not gender specific; boys will find things they will enjoy using or wearing. There will be products that adults will find appealing as well, such as technology accessories. “The word ‘girl’ in Kirby Girl is more of a spirit and a sense of fun, spirited, and kind nature, and it doesn’t matter how old you are. Whether you’re 2 or you’re 92, there’s a girl in everyone, and whether you’re a boy or a girl, there’s a girl in everyone,” Ms. McCleary said. Another offering is personalization; customers will be able to have items customized, such as it’s their own trucker hats, water bottles, or crazy stamps for clutches and bags. “It’s really important for anyone coming of age to not look like everyone else. You shouldn’t dress like anyone else and you should do your own thing, and be psyched about that.” Ms. McCleary exclaimed. Fun things come in all size packages. In addition to promoting an awareness of Kirby Girl through social media, (Instagram: @shopkirbygirl & Facebook: KIRBY GIRL), the team is also relying on local girls and boys to spread the word. 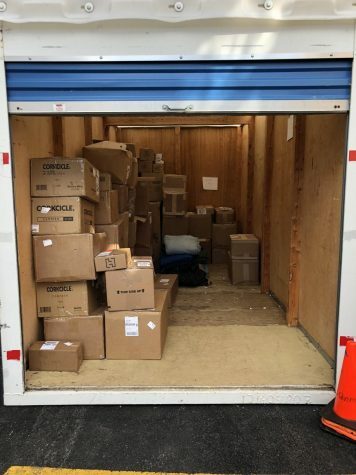 While the store is in Darien, there is hope for their products to launch online by the end of the summer. As she did with Kirby and Company, Ms. McCleary believes that she will get to know and what the perfect assortment of products will be for the kids in town. “We fully expect that the girls in this town are going to be our brand ambassadors and help us create a better brand.” Ms. McCleary said. For Ms. McCleary, there is no balance between being a parent and a business owner. Some days she feels like a really good mom, and those are usually the days when something goes wrong at her store. The days when business is going well and everything gets done, she will forget to pick up her kids from school or make dinner. Despite all of this, she has learned over the years that it is important to give yourself a break, ask for help when needed, and accept that you will not complete everything in one day; there is always the next day to get your task complete. Ms. Kirby admitted that she would not be able to manage both stores without the help of others. A piece of advice she gives to aspiring entrepreneurs is that if you are interested and passionate about owning a business, you need to learn your craft, rather than jumping into it. Knowing many aspects of your personality is important to make sure it’s a good match. “Learning to run a business is so important at any age and for any part of your career, whether you end up working for someone else your whole life or you want to do your own thing. Go and work for an entrepreneur somewhere and learn because there’s so many out there.” Ms, McCleary said. There is a big party planned for the community to help celebrate the opening at the end of May. Be sure to like and follow their social media pages for fun updates!